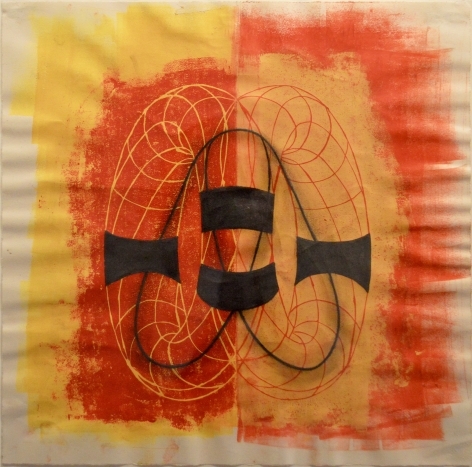 14 3/4" x 14 1/4"
Anders Wahlstedt Fine Art is pleased to announce the exhibition “Sculptural Drawings,” a group show of works on paper by Mel Kendrick, John Newman and Chris Macdonald. Mel Kendrick’s work can be found in numerous permanent collections, including Art Institute of Chicago; Brooklyn Museum; Metropolitan Museum of Art; Museum of Modern Art; National Gallery of Art; Storm King Art Center; Whitney Museum of American Art; & Walker Art Center. 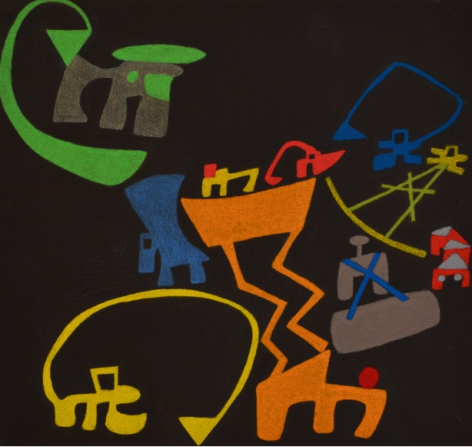 John Newman’s work can be found in numerous permanent collections, including Museum of Modern Art; Philadelphia Museum of Art; Tate Gallery; Metropolitan Museum of Art; Storm King Art Center; & Los Angeles County Museum of Art. Chris Macdonald uses oil crayon, pencil, and graphite to construct his drawings. These whimsical works on paper have a wonderful playfulness about them, and at the same time, the compositions create tension and a chaotic energy. The shapes themselves call to mind abstracted silhouettes and forms of construction vehicles in the vibrant colors one recalls from toy cars and trucks. “Machines interest me in a futuristic way. What type of machines will people of the future have to transport themselves? We all have our own ideas about this – my sculptures, drawings, and smaller works represent some of mine,” Macdonald has said. Chris Macdonald’s work can be found in numerous permanent collections, including Whitney Museum of American Art; Brooklyn Museum; Walker Arts Center; Corcoran Gallery of Art; Musee d’Art Moderne, Centre Georges Pompidou; & Socrates Sculpture Park.